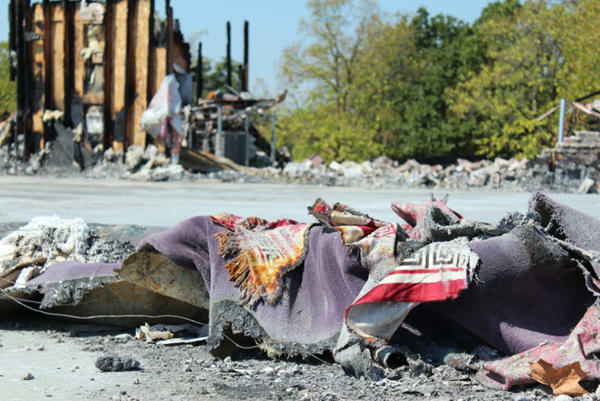 Remnants of prayer rugs lie amid the rubble of what used to be a mosque in Joplin. The mosque burned down on Aug. 6. The fire is still under investigation. It’s been about one month since a fire destroyed the only mosque in Joplin. Now, members of the Islamic Society of Joplin – and the interfaith community there – are picking up the pieces. The mosque was burned down before daylight on August 6, during the holy month of Ramadan. The FBI is still investigating the cause of the fire. Earlier in summer, on July 4, someone tried to set fire to the roof. That incident is still under investigation, too. Some Joplin residents say the tornado that tore through the town in the spring of 2011 has influenced the way the community has responded to the fire. In this week's faith and values update, we take a visit to Joplin and find out more about the support the Islamic community has received – particularly from people of other faiths. This show is produced in partnership with ColumbiaFAVS, mid-Missouri's source for news about faith and values.